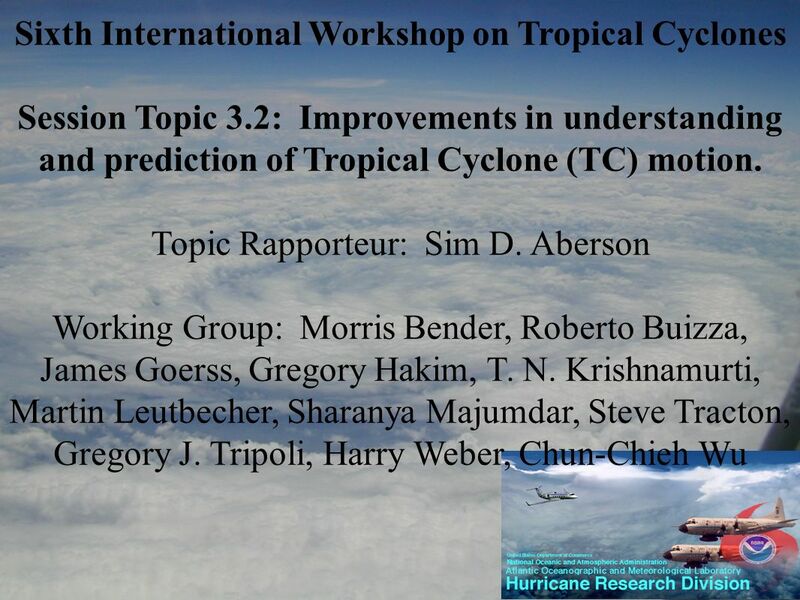 Sixth International Workshop on Tropical Cyclones Session Topic 3.2: Improvements in understanding and prediction of Tropical Cyclone (TC) motion. Topic. 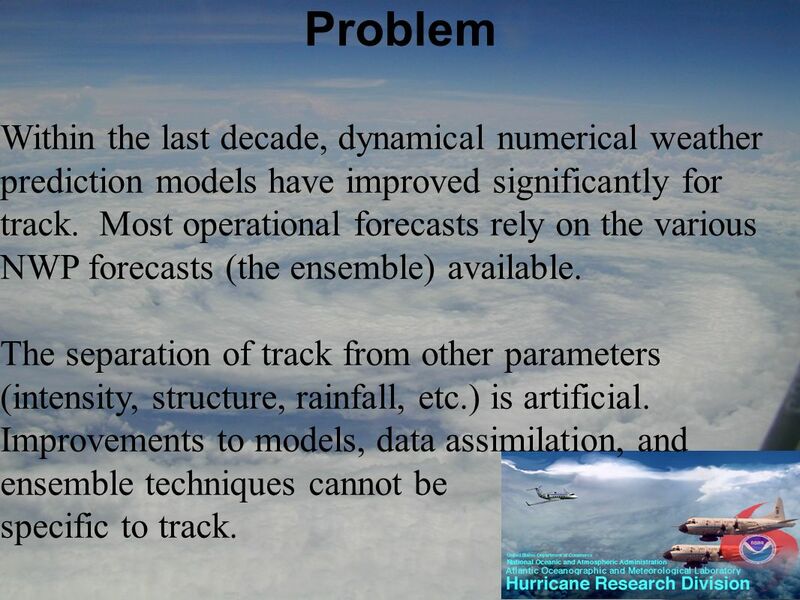 3 Problem Within the last decade, dynamical numerical weather prediction models have improved significantly for track. 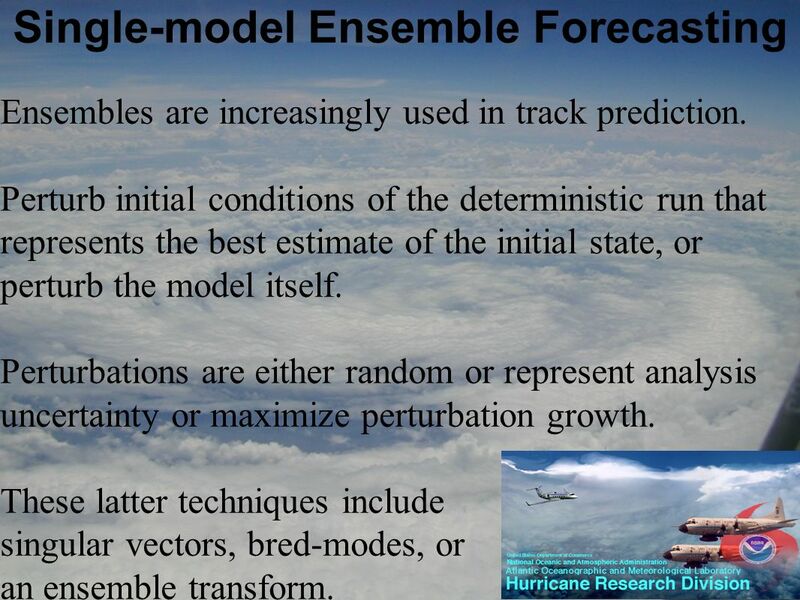 Most operational forecasts rely on the various NWP forecasts (the ensemble) available. 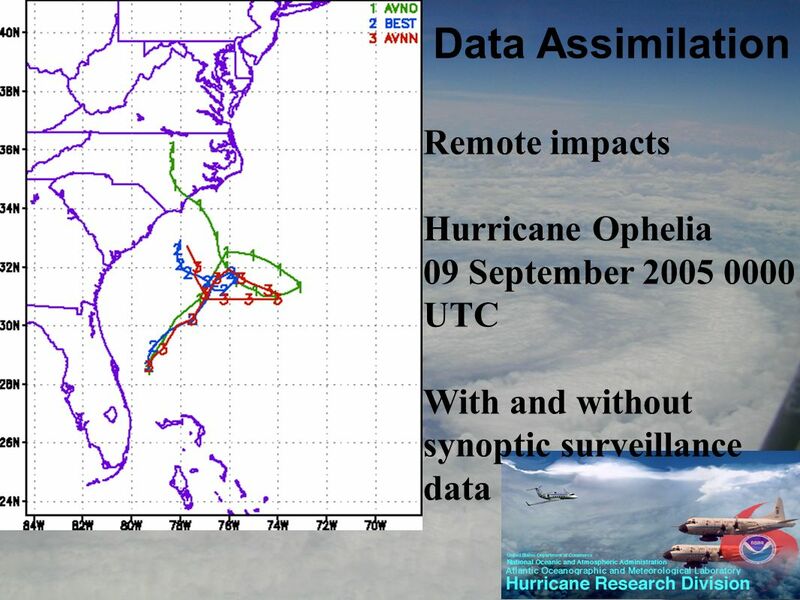 The separation of track from other parameters (intensity, structure, rainfall, etc.) is artificial. Improvements to models, data assimilation, and ensemble techniques cannot be specific to track. 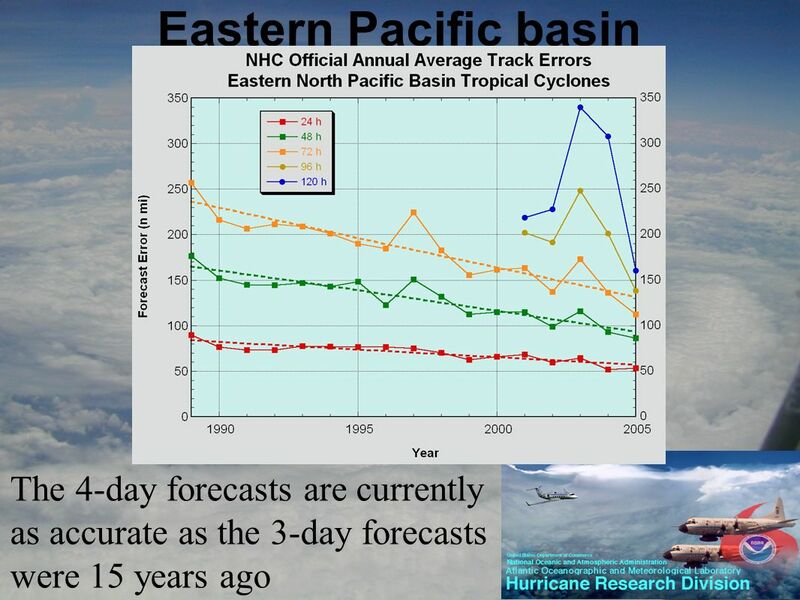 4 Operational track forecasting The U.S. National Weather Service extended forecasts to 120 h from 72 h in the Atlantic and Eastern and Central Pacific basins in 2003. 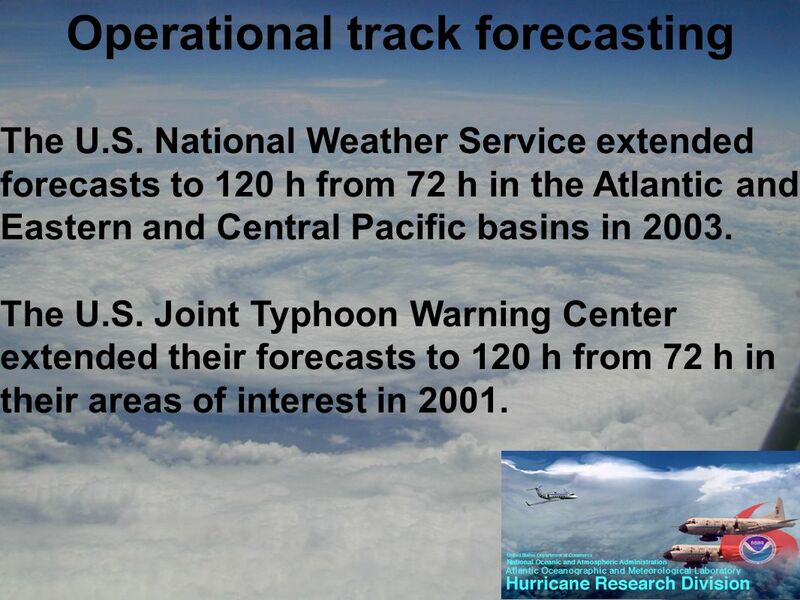 The U.S. Joint Typhoon Warning Center extended their forecasts to 120 h from 72 h in their areas of interest in 2001. 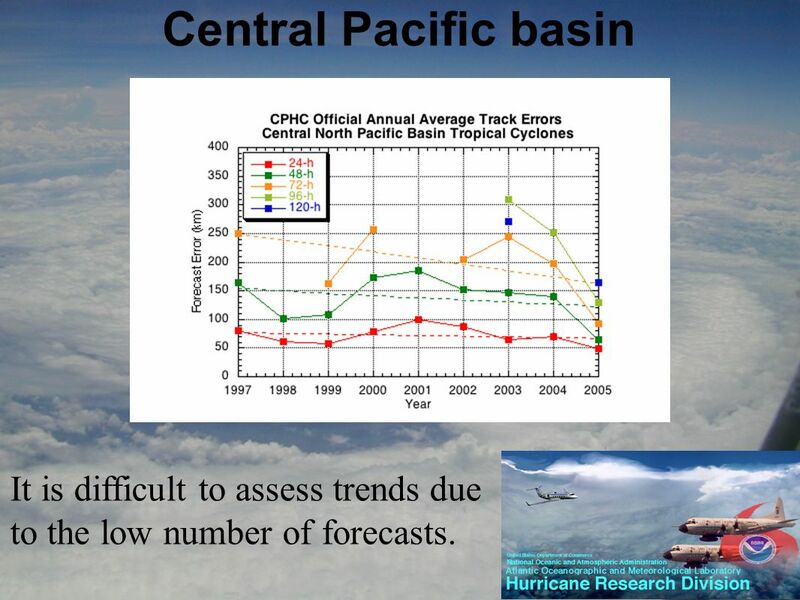 7 Central Pacific basin It is difficult to assess trends due to the low number of forecasts. 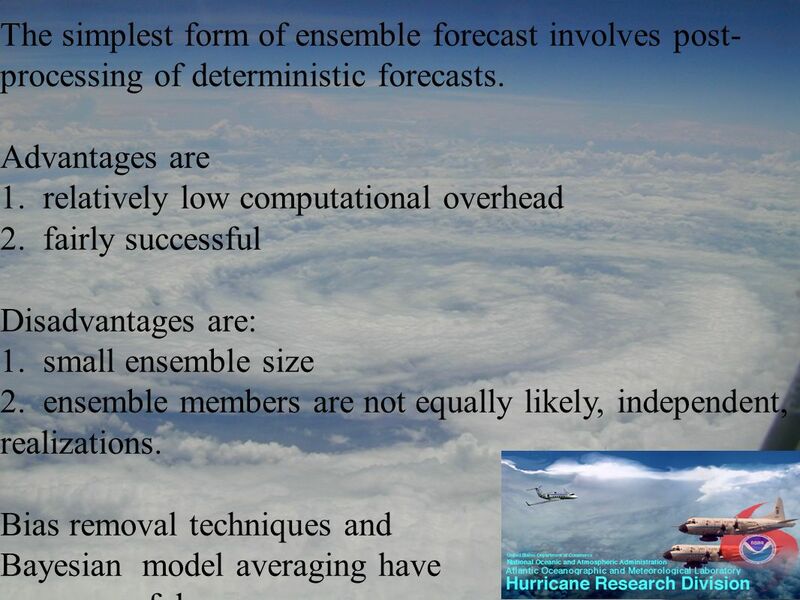 9 Single-model Ensemble Forecasting Ensembles are increasingly used in track prediction. Perturb initial conditions of the deterministic run that represents the best estimate of the initial state, or perturb the model itself. Perturbations are either random or represent analysis uncertainty or maximize perturbation growth. These latter techniques include singular vectors, bred-modes, or an ensemble transform. 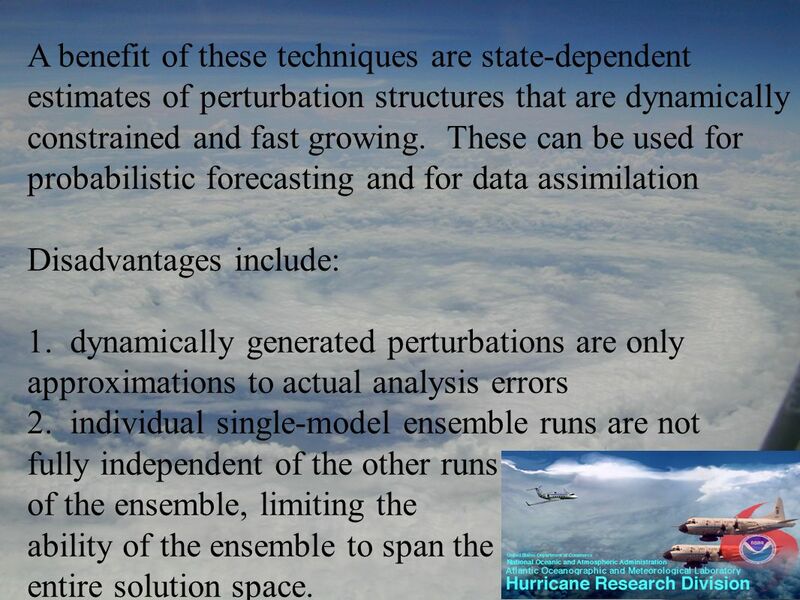 10 A benefit of these techniques are state-dependent estimates of perturbation structures that are dynamically constrained and fast growing. These can be used for probabilistic forecasting and for data assimilation Disadvantages include: 1. dynamically generated perturbations are only approximations to actual analysis errors 2. individual single-model ensemble runs are not fully independent of the other runs of the ensemble, limiting the ability of the ensemble to span the entire solution space. 11 The Australian Bureau of Meteorology (? ), the Canadian Meteorological Centre (32), the China Meteorological Administration (? 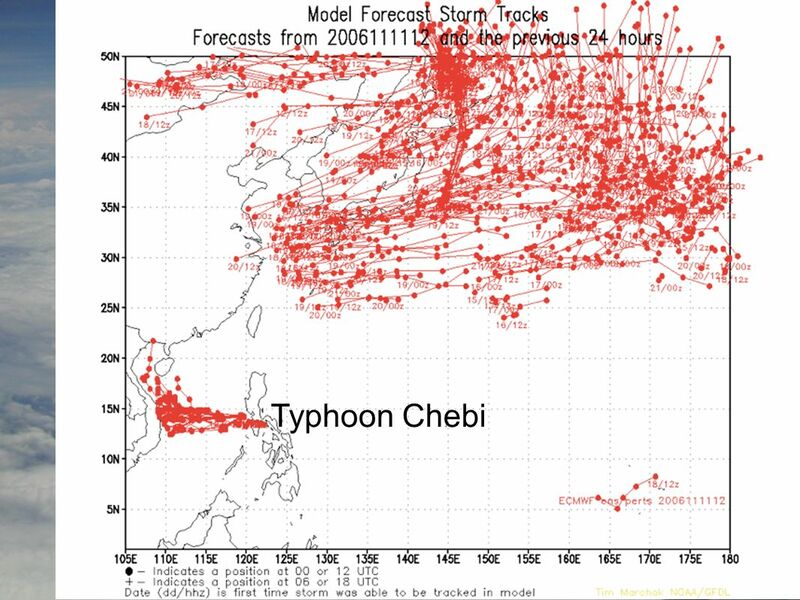 ), the European Centre for Medium- Range Weather Forecasting (100), the Japan Meteorological Agency (50),the Korea Meteorological Administration (32), the U.S. National Weather Service (56) now provide 270+ global and regional ensemble forecasts daily. 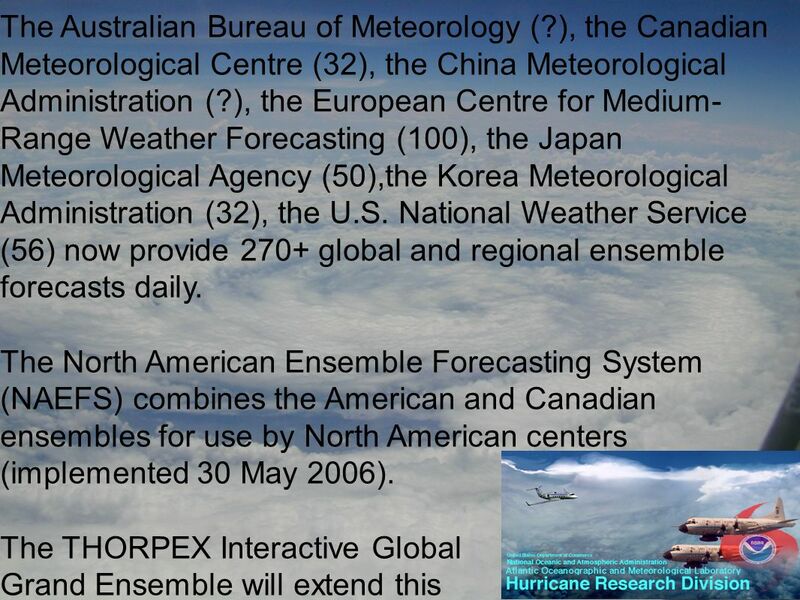 The North American Ensemble Forecasting System (NAEFS) combines the American and Canadian ensembles for use by North American centers (implemented 30 May 2006). The THORPEX Interactive Global Grand Ensemble will extend this globally, though not all national centers have committed to involvement. 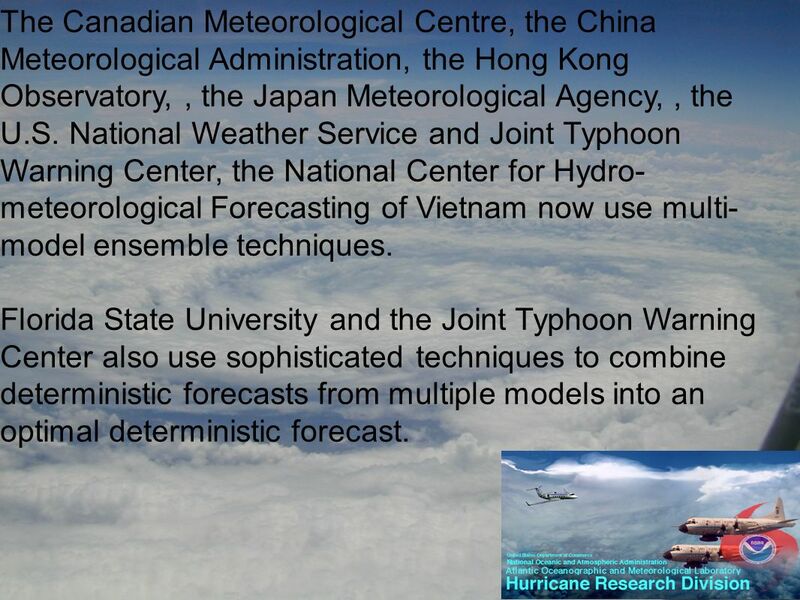 17 The Canadian Meteorological Centre, the China Meteorological Administration, the Hong Kong Observatory,, the Japan Meteorological Agency,, the U.S. National Weather Service and Joint Typhoon Warning Center, the National Center for Hydro- meteorological Forecasting of Vietnam now use multi- model ensemble techniques. 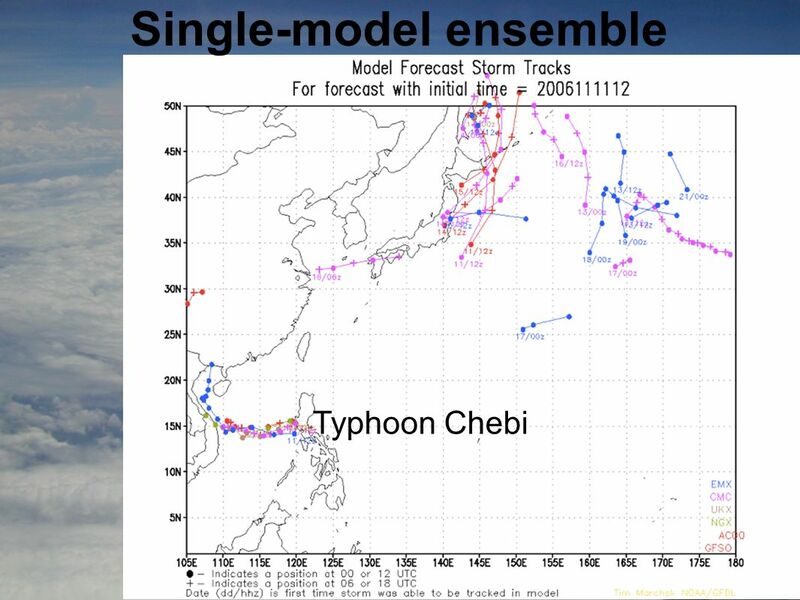 Florida State University and the Joint Typhoon Warning Center also use sophisticated techniques to combine deterministic forecasts from multiple models into an optimal deterministic forecast. 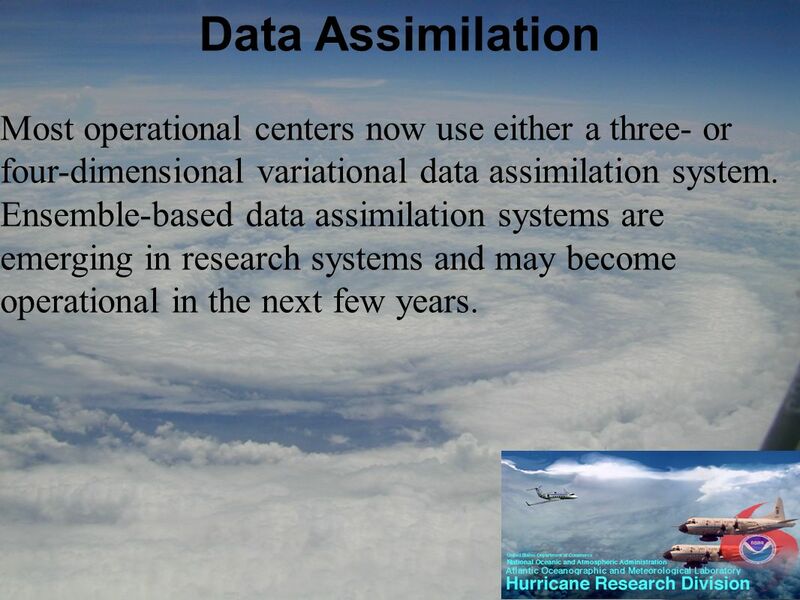 19 Data Assimilation Most operational centers now use either a three- or four-dimensional variational data assimilation system. Ensemble-based data assimilation systems are emerging in research systems and may become operational in the next few years. 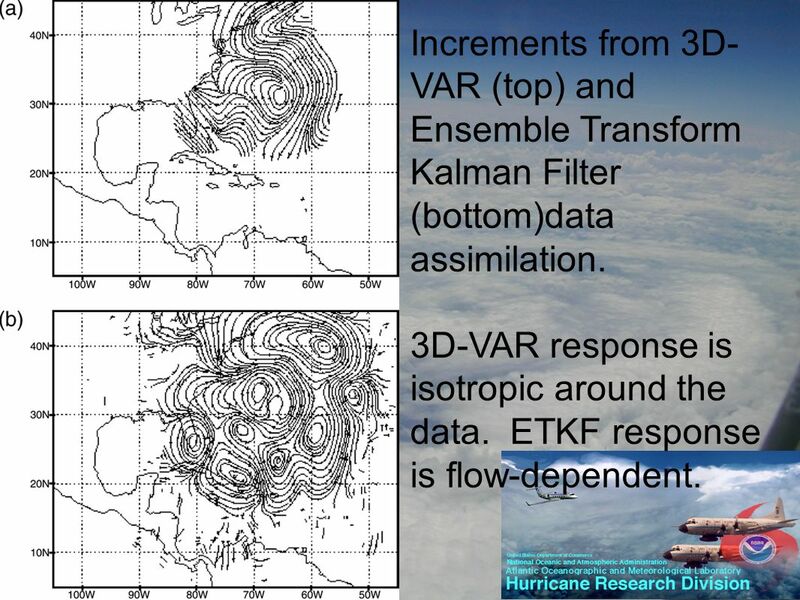 20 Increments from 3D- VAR (top) and Ensemble Transform Kalman Filter (bottom)data assimilation. 3D-VAR response is isotropic around the data. ETKF response is flow-dependent. 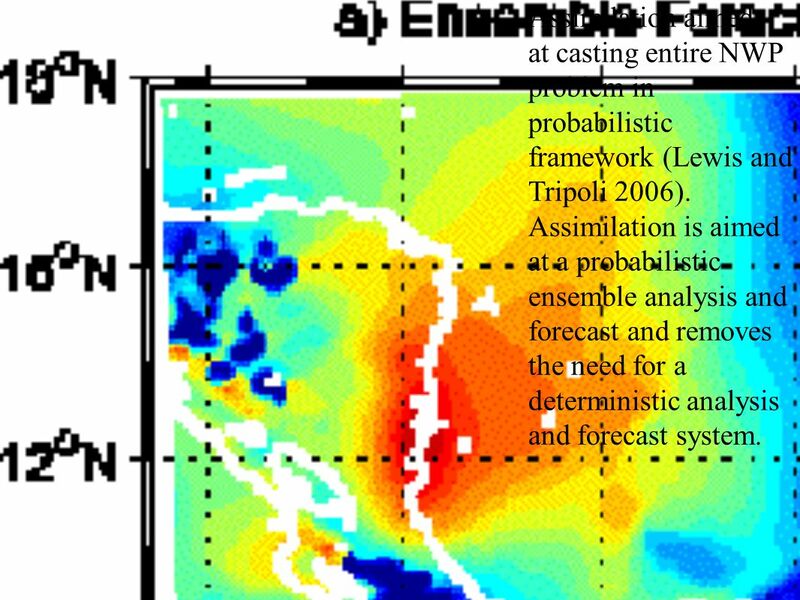 21 Assimilation aimed at casting entire NWP problem in probabilistic framework (Lewis and Tripoli 2006). 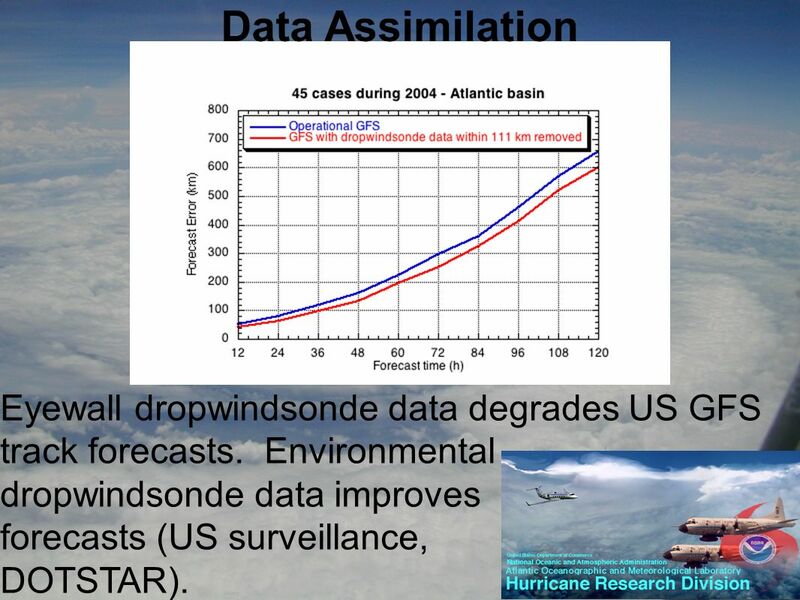 Assimilation is aimed at a probabilistic ensemble analysis and forecast and removes the need for a deterministic analysis and forecast system. 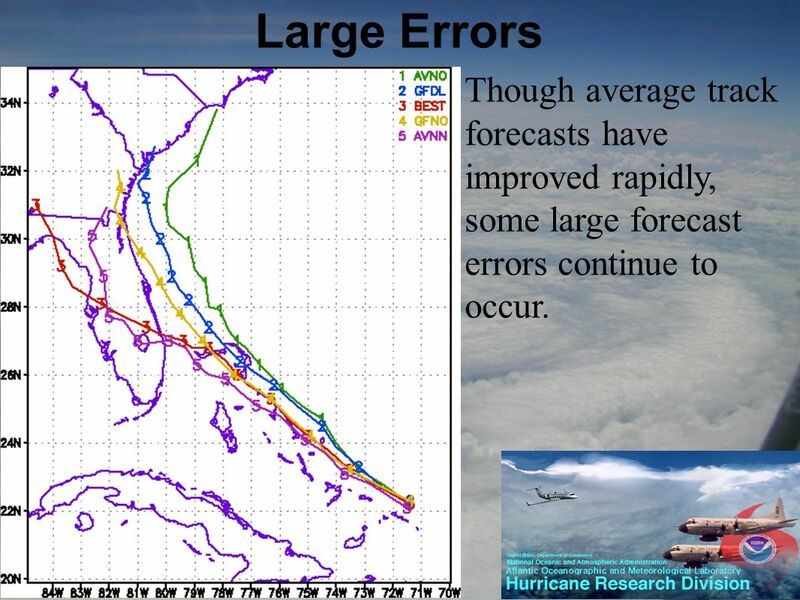 23 Large Errors Though average track forecasts have improved rapidly, some large forecast errors continue to occur. 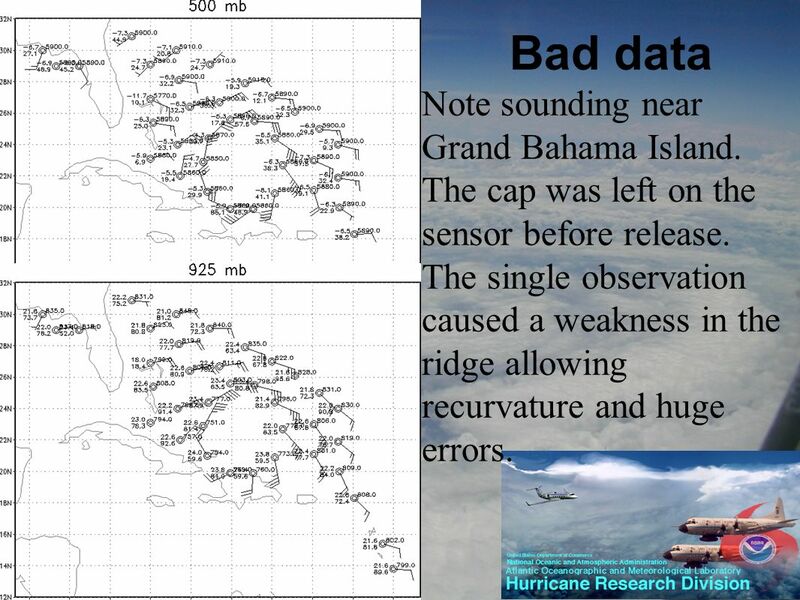 24 Bad data Note sounding near Grand Bahama Island. The cap was left on the sensor before release. The single observation caused a weakness in the ridge allowing recurvature and huge errors. 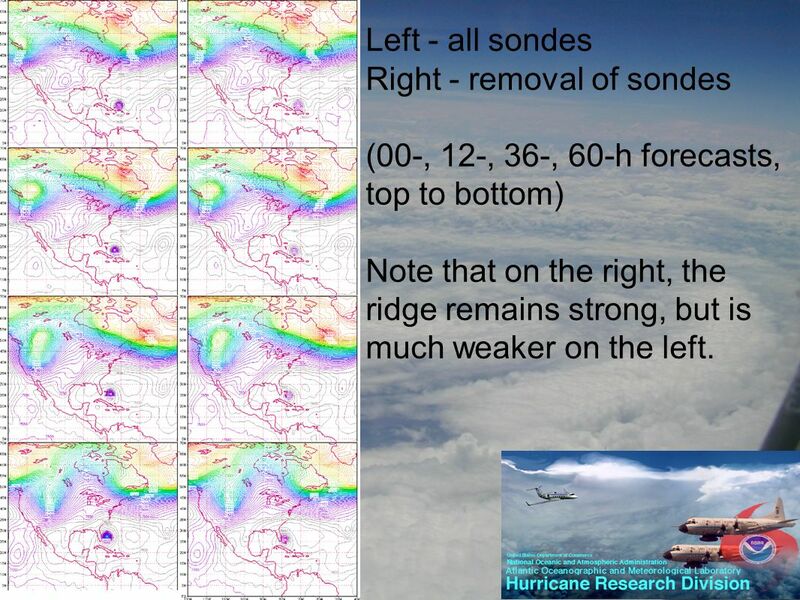 25 Left - all sondes Right - removal of sondes (00-, 12-, 36-, 60-h forecasts, top to bottom) Note that on the right, the ridge remains strong, but is much weaker on the left. 28 Impact of data. Note small increment in upper left. 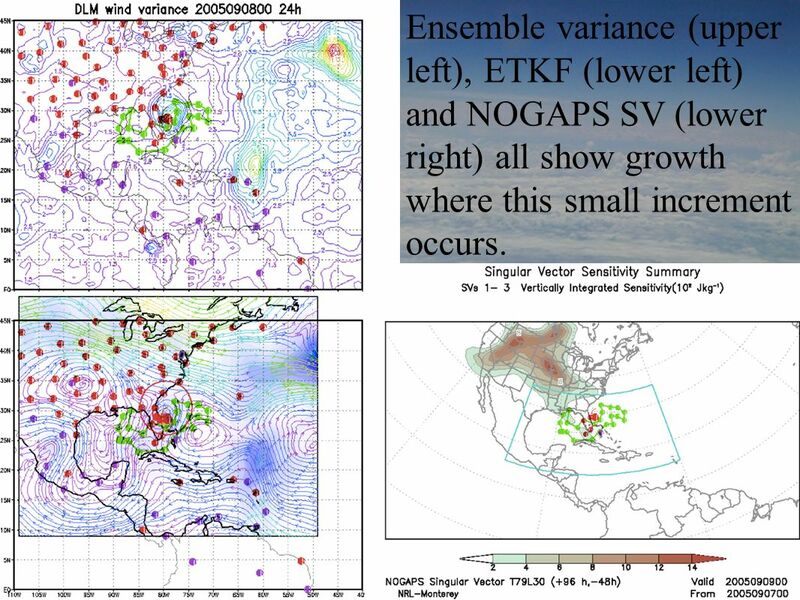 29 Ensemble variance (upper left), ETKF (lower left) and NOGAPS SV (lower right) all show growth where this small increment occurs. 30 00-, 12-, 36-, 60-, 72- h 400 hPa vorticity (top to bottom). Vorticity maximum in all dropwindsonde run (right) is much stronger than in no dropwindsonde run (left). 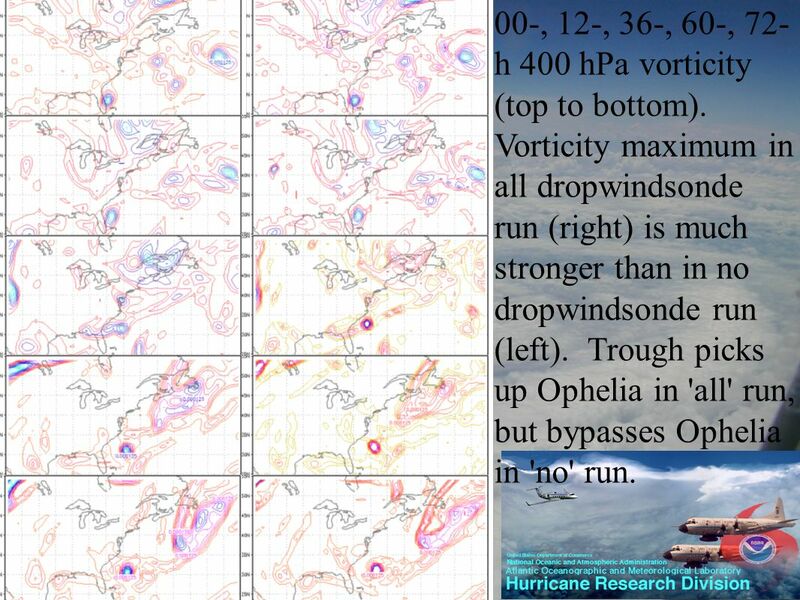 Trough picks up Ophelia in 'all' run, but bypasses Ophelia in 'no' run. 31 Recommendations 1. 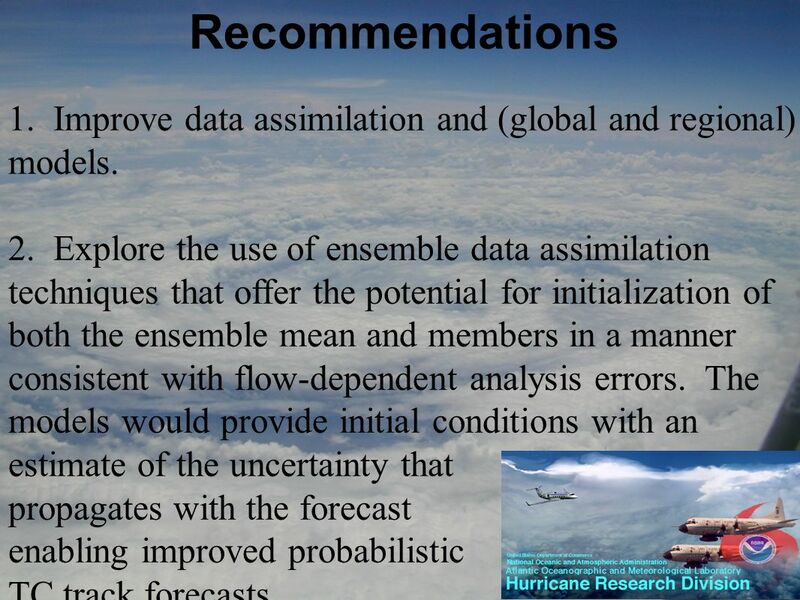 Improve data assimilation and (global and regional) models. 2. Explore the use of ensemble data assimilation techniques that offer the potential for initialization of both the ensemble mean and members in a manner consistent with flow-dependent analysis errors. The models would provide initial conditions with an estimate of the uncertainty that propagates with the forecast enabling improved probabilistic TC track forecasts. 32 Recommendations 3. 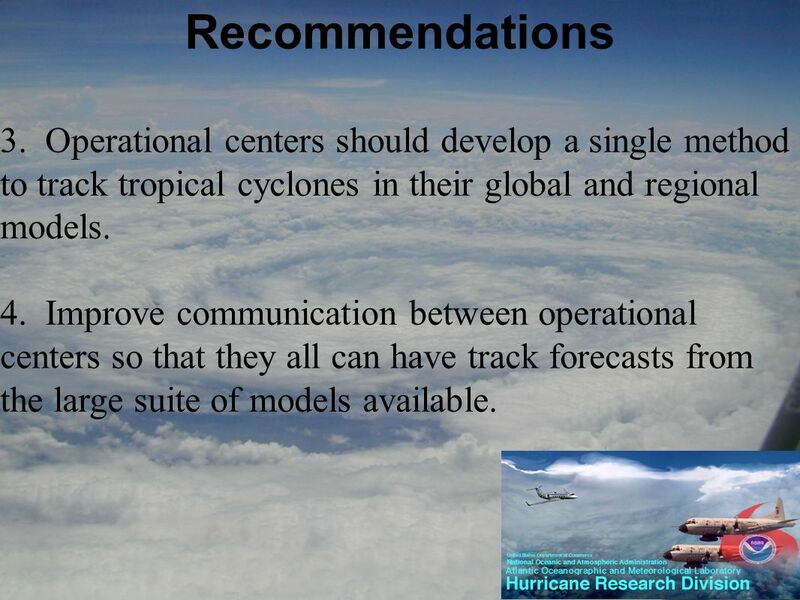 Operational centers should develop a single method to track tropical cyclones in their global and regional models. 4. Improve communication between operational centers so that they all can have track forecasts from the large suite of models available. 33 Recommendations 5. 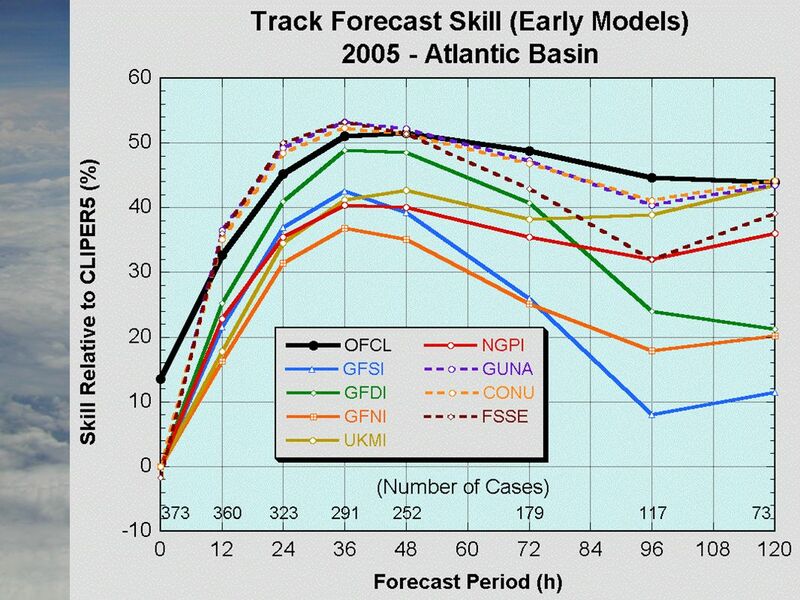 A single global database of track forecasts should be created for operational use as well as research into track forecast improvements. 6. 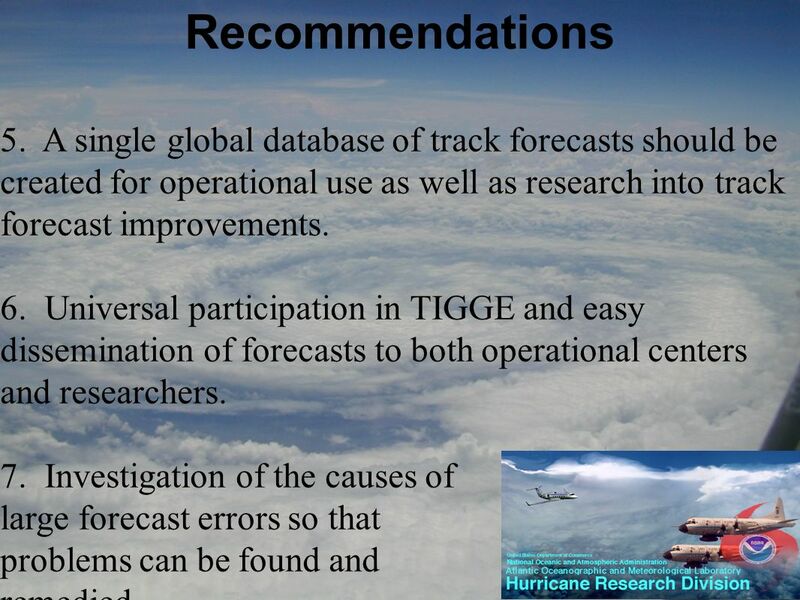 Universal participation in TIGGE and easy dissemination of forecasts to both operational centers and researchers. 7. 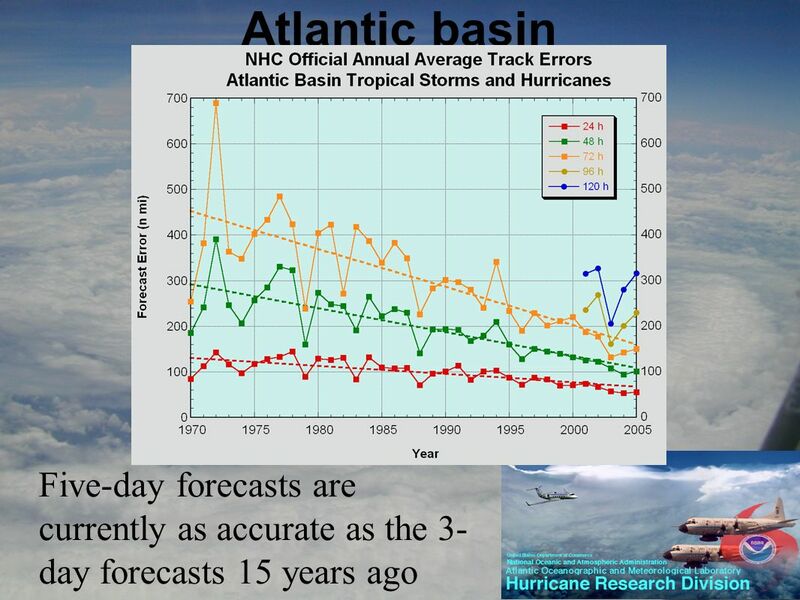 Investigation of the causes of large forecast errors so that problems can be found and remedied. Download ppt "Sixth International Workshop on Tropical Cyclones Session Topic 3.2: Improvements in understanding and prediction of Tropical Cyclone (TC) motion. Topic." RSMC La Réunion activities regarding SWFDP Southern Africa Matthieu Plu (Météo-France, La Réunion), Philippe Arbogast (Météo-France, Toulouse), Nicole. 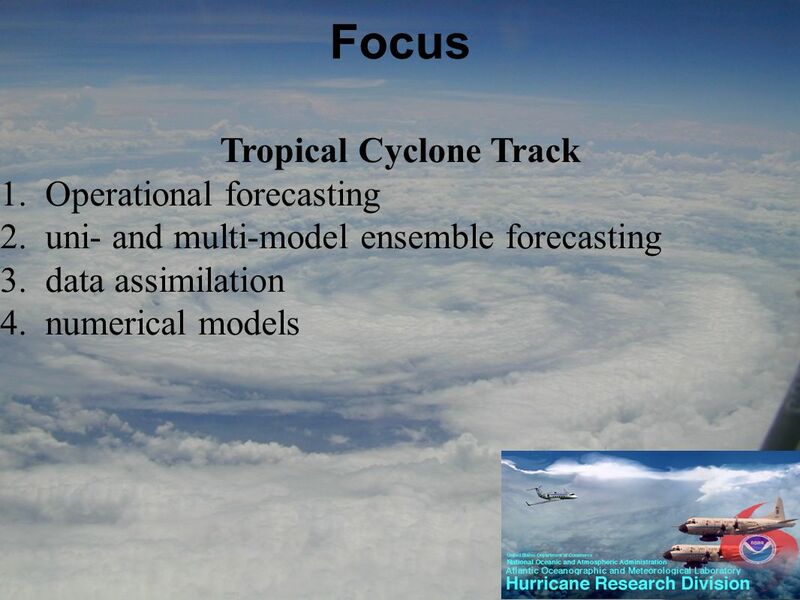 TOPIC 3 CHAIR REPORT TROPICAL CYCLONE MOTION Russell L. Elsberry OUTLINE Need to improve track prediction –Importance of track forecast Opportunities to. Sixth International Workshop on Tropical Cyclones 21 – 30 November 2006, San Jose, Costa Rica Topic 3.1 : Advances and Requirements for Operational Tropical. 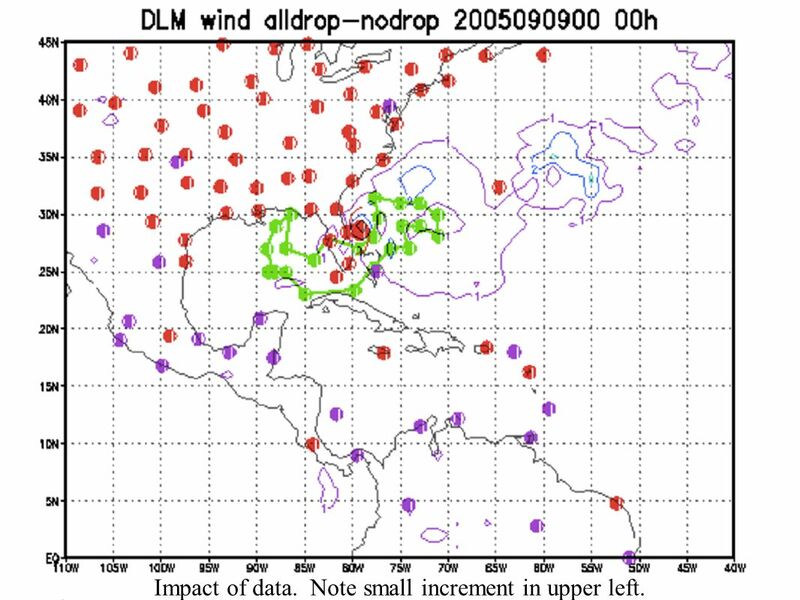 SIX INTERNATIONAL WORKSHOP ON TROPICAL CYCLONES 2006 IWTC-VI SAN JOSE, COSTA RICA NOVEMBER 2006 TOPIC 0.1 QUANTITATIVE FORECASTS OF TROPICAL CYCLONES LANDFALL. Topic 3.3: Targeted observations and data assimilation in track prediction Rapporteur: Chun-Chieh Wu PSA Working Group: Sim Aberson, Brian Etherton, Sharanya. 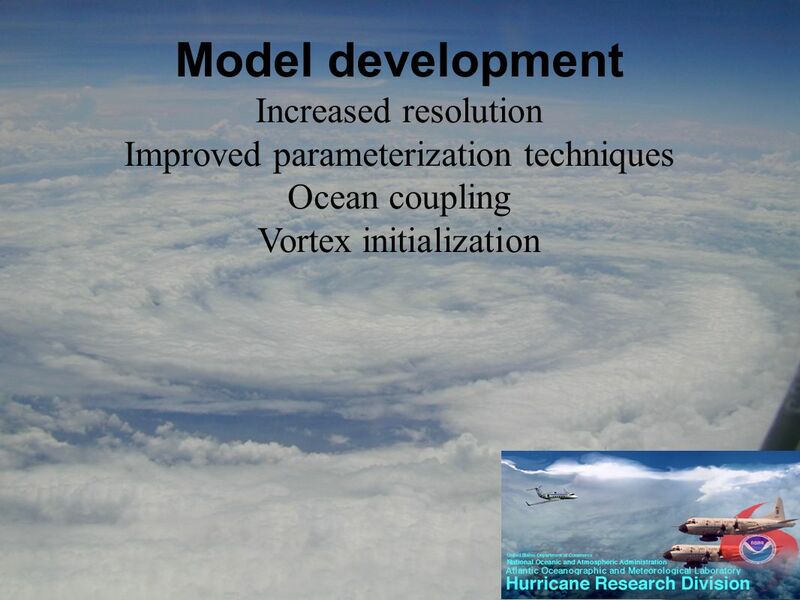 External Influences on Cyclone Formation Working Group 2.1 W. M. Frank, G. J. Holland, P. Klotzbach, J. L. McBride, P. E. Roundy Contributions: J. Molinari. 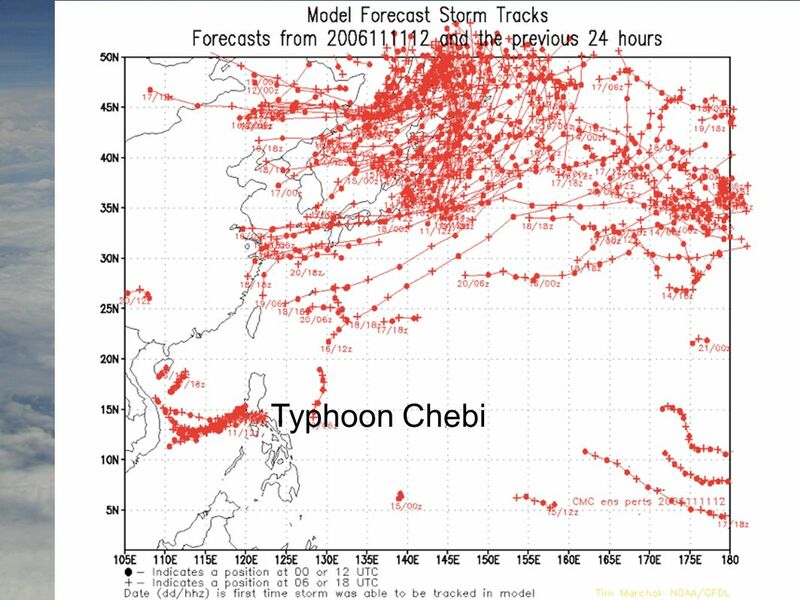 Operational Numerical Forecasting on Tropical Cyclones Yuqing Wang International Pacific Research Center and Department of Meteorology University of Hawaii. Application to Heavy Rainfall KYOUDA Masayuki Numerical Prediction Division, Japan Meteorological Agency 9 th THORPEX GIFS-TIGGE Working Group meeting. ECMWF Training Course 2005 slide 1 Forecast sensitivity to Observation Carla Cardinali. Richard (Rick) Jones Regional training Workshop on Severe Weather SEA, Macau, 8-13 April, 2013. 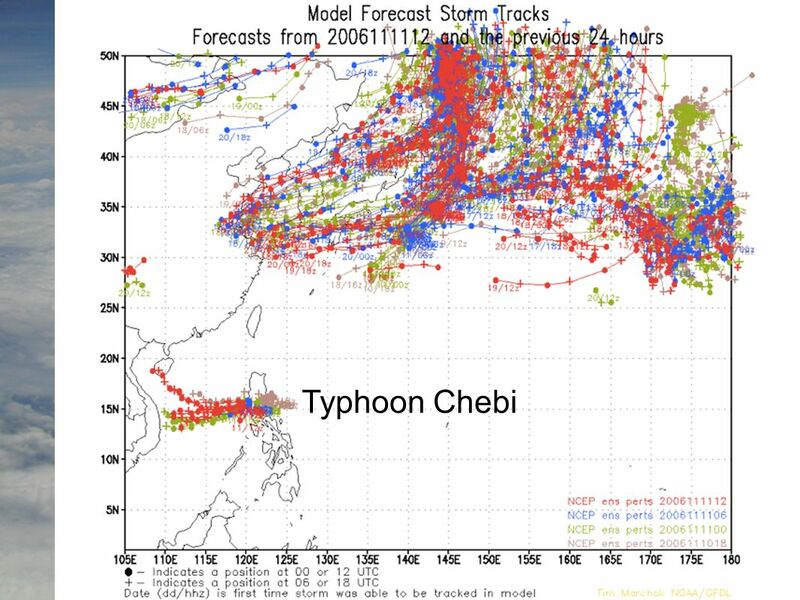 Translating Scientific Advancement into Sustained Improvement of Tropical Cyclone Warnings – the Hong Kong Experience C.Y. Lam Hong Kong Observatory Hong. Predictability Issues Associated with Explosive Cyclogenesis in the North-West Pacific Edmund K.M. Chang School of Marine and Atmospheric Sciences Stony. 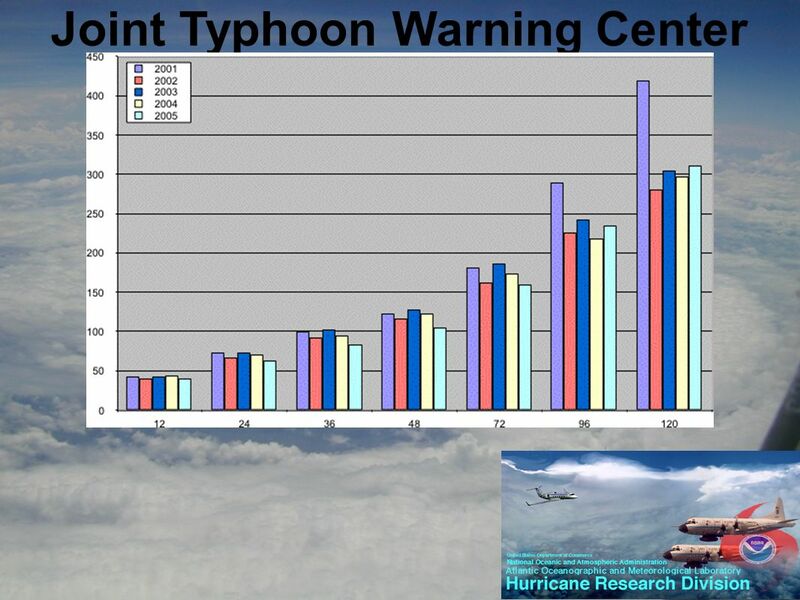 Joint Typhoon Warning Center Forward, Ready, Responsive Decision Superiority UNCLASSIFIED An Overview of Joint Typhoon Warning Center Tropical Cyclone. Proposed Predictability, Dynamics & Ensemble Forecasting Expert Team Richard Swinbank, with Heini Wernli, Masayuki Kyouda and Istvan Szunyogh, and thanks. “A LPB demonstration project” Celeste Saulo CIMA and Dept. of Atmos. and Ocean Sciences University of Buenos Aires Argentina Christopher Cunningham Center. Munehiko Yamaguchi Typhoon Research Department, Meteorological Research Institute of the Japan Meteorological Agency 9:00 – 12: (Thr) Topic.